Today is our 3rd Wedding Anniversary. Like all the past years, we did not celebrate elaborately. Infact, a few days after our 2nd Anniversary last year I was looking through some letters on the cupboard where we usually put our mails and saw this newly-bought card with wrapper still wrapped on it. It says "Happy Anniversary", I asked Meng what is this card doing there & who is it for? He said "Ooops! It's for you. I forgot to write on it. Happpy anniversary!". >.< I know. This morning I went to the gym in the morning for "Bums, Tums & Thighs" class and realised just how unfit I am. I was partnering this must-be-60plus indian lady & I think she moved faster than me. Then, towards the end of the class, I had "bum cramp" - I always have this when I do vigorous exercise and never knew it was a cramp. I always thought i had somehow sprained my back! Anyhow, the instructor came to me & told me how I can relieve the cramp: Lie down on my tummy with legs stretched out. Then fold one leg & hold it with the opposite hand for 10-15secs each leg. I did 4 sets & I felt better. Today is also the 1st time I put Shean Wenn in a creche. 15 mins before my class starts, I brought her there with her water bottle, a change of clothes & some wipes. A carer held her hands & walked her into the room as I had to dash out to get a token for the Creche service. When I returned to the room, SW was quietly playing at the kitchen set area. I signed in for the creche, bid my farewell to her ("Mummy will be back ok? Love you!") & gave her a kiss. She didn't even bat an eyelid! I walked out feeling proud (that she didnt cling to me) and yet also a tinge of sadness (my girl is growing up so fast!). After my class, I went to look for a friend of mine who is at the gym. Then, we both went to the creche to pick SW up. I showed my friend around the baby-gym area because she was thinking of bringing her own daughter there one day. After that, SW & I walked around the area near the gym (there is a town centre there). I spied a Primark* store there & excitedly went in to browse. I found a very thick rain mac for SW. There were only 2 sizes left, one for 2-3YO and another for 5-6YO. I asked a supervisor to check if there were any 3-4YO sizes & they came out telling there isn't any left. Left in a conundrum, I chose to buy the bigger size (5-6YO). I thought it's just slightly longer & i can fold the sleeves up. The 2-3YO fits just snugly & i was worried if during chilly times, the rain mac will not zip up well above all the thick clothes. When I showed Meng in the evening, he frowned & said it's too big. It isn't! Anyway, it is just an outerwear and she won't be wearing it that often. I think buying bigger size will do & it will last longer. For dinner, I cooked pork ribs with chinese sauce and some vegetable. That was our "romantic" dinner. We wished each other a Happy Anniversary & proceeded to have our dinner. It was just like any other day. Three years on, we have a beautiful 2YO daugher. 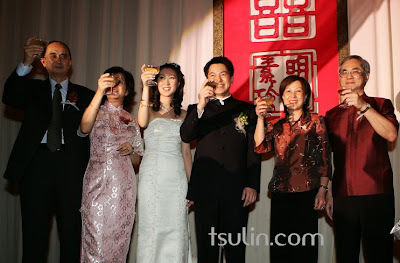 I am very grateful for having all my family & loved-ones with me. I feel grateful that we have a roof over our head, more than enough food on the table, being able to experience the joy & laughter blessed to us in the form of Shean Wenn, good body and good health. Happy Anniversary to you, my (other) darling Meng! 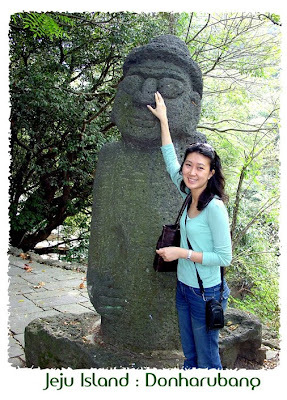 On our honeymoon at Jeju Island, the guide told us that in Korean mythology, the "Tol-harubang" (pictured above, the statue next to me) which means Stone Grandfather is a God of fertility & the Koreans have a superstition that if you rub its nose, you will get a son. If you rub its ears, a daughter. Obviously, it remains a superstition/myth. Our guide also told us it wasn't true for them (he & his wife have a daughter as well - they are Russians). *Primark : A value for money clothing retailer who offers plenty of fashionable choices which won't burn a hole in your pocket. My husband ("the hub") usually puts Shean Wenn to bed at night. Whenever he is at home (ie if he comes home early enough), they will sing a few songs or read a few books prior to bed-time. Due to this, SW will instinctively know a few nursery rhymes/songs. Last week, she demonstrated that she can sing a whole song on her own. Well, the lyrics are not entirely "correct" but the gist is there. I consider it a good try! 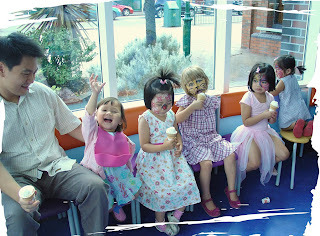 You gotta love McDonald's : Ice-cream, french fries, chicken nuggets & face painting! The ice-cream keeps them quiet for awhile. Last Saturday Shean Wenn attended her first McDonald's party. The birthday girl Joyee turned 4 and is a very girly girl, her fav colours are pink, purple & she loves cats! So I got her a pink watch with cats on the dial & strap. I think she should like it. 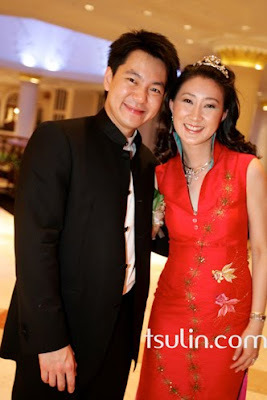 Shean Wenn enjoyed herself, she even handpicked her outfit - the dress & the boots. She loves her boots, this girl. 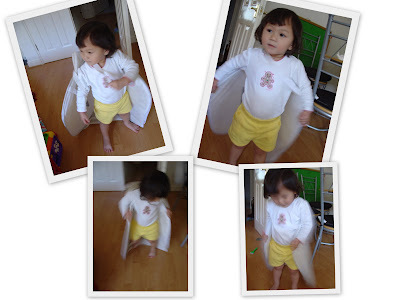 Yesterday afternoon as I was lying on my bed resting, I heard Shean Wenn talking excitedly, "Butterfly butterfly!! Fly... Up im de kai (Up in the sky)!". I sat up and turned around and saw the biggest & most beautiful butterfly I have ever seen! The GIANT BUTTERFLY in my living room. Does it look familiar? Yes, but of course it is none other than Shean Wenn donned in what seems to be our Ikea laundry basket (she helped me unload all the washes in the morning and hence it is empty and she could play in it) - carefully & creatively strung around across 1 of her arms. Now, who says kids need expensive toys to keep them happy & entertained?